NYON, Switzerland — Bayern Munich forward Thomas Mueller has been banned from both games against Liverpool in the Champions League round of 16. UEFA's disciplinary panel imposed a two-game ban on Friday for Mueller's red card after a bad tackle against Ajax last month. The panel added one more game to the mandatory one-match ban for a straight red card. Bayern plays at Liverpool on Feb. 19 and hosts the second leg on March 13 in a clash of five-time European champions. 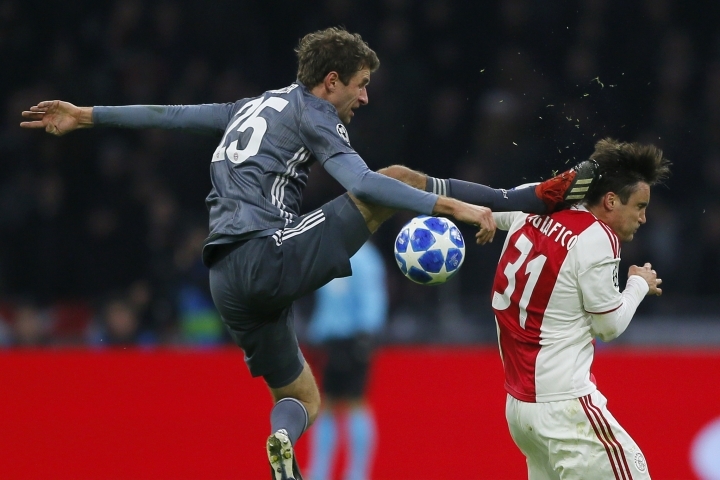 Ajax's Maximilian Woeber also misses the round of 16 games — against Real Madrid — for his red card in a separate incident during his team's 3-3 draw with Bayern in the final group-stage game. UEFA also fined Ajax 20,000 euros ($23,000) and Bayern 8,000 euros ($9,200) for separate incidents involving fans. In other rulings, Paris Saint-Germain was fined 35,000 euros for a range of charges, including crowd disturbances and "improper conduct of officials" at a 6-1 win over Red Star Belgrade in October. Red Star must pay 25,000 euros for "illicit chants" by its fans, who attended the game at Parc des Princes despite a UEFA ban on the club selling tickets to traveling fans. Olympiakos was fined 90,000 euros for fan disorder at a Europa League home game against AC Milan last month. The Greek club risks a one-game stadium closure for a repeat offense in the next two years. After clashes between fans and Rome police at a Europa League game last month, UEFA also fined Eintracht Frankfurt 80,000 euros. UEFA also threatened Eintracht with a one-game ban on selling tickets to an away game in the Champions League or Europa League in the next two years. Lazio was not sanctioned despite photographs circulating of a group of its fans appearing to make Nazi salutes at the Olympic Stadium. Soccer Out is the go-to place for diehard soccer fans to receive only soccer focused news. Copyright © 2015 - 2019 Soccer Out. All Rights Reserved.